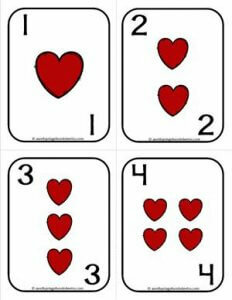 This set of number cards 1-20 is what I call the “suits deck”. It has images of the suits in the middle of the cards representing the number of that card. They have a happy and fun vibe to them. My question to you would be “How many math card games and activities can you think of to go with these cards?” I thought about it and I came up with 20! And that doesn’t include building houses of cards. I’m sure you’ll find tons of ways to use this learning tool in your classroom.